The bodies of girls and women are presented in alarmingly unrealistic depictions across most media, from movie leads to advertising models to Disney princesses. This idealized body has all sorts of negative effects, from body dissatisfaction to eating disorders to simply not representing how girls and women actually look. 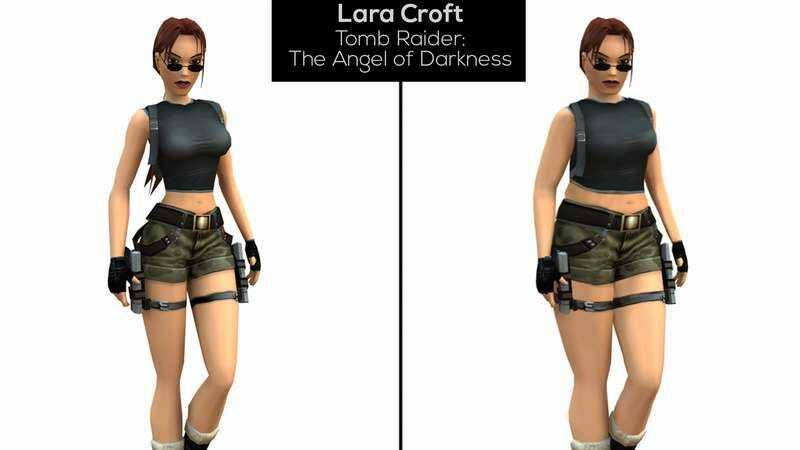 The anti-bulimia website Bulimia.com Photoshopped several female characters in video games to demonstrate the difference between actual human proportions and the idealized, ridiculously thin and large-breasted women populating video games like Tomb Raider and Grand Theft Auto. These characters’ waists are widened, breasts shrunk, and legs enlarged to resemble what women actually walk on rather than sticks. They still look great; Tifa of Final Fantasy VII still rocks her miniskirt-suspenders outfit, the only difference being that her body looks less like a Barbie doll and more like a human young woman, representing something closer to an average body type. She could probably fight even better with the real body to support her. Her character isn’t a model; she’s a badass fighter. Which raises the question: Why don’t video game developers make female characters to resemble the way the girls and women playing their games actually look? The same goes for men’s bodies; this idealized body image cuts both ways, though bulimia and anorexia are significantly higher among girls and women. Bulimia.com has also Photoshopped superheroes so their bodies resemble average American sizes; obviously, boys seeing jacked-up Batman as a male body ideal is just as unrealistic as girls seeing Poison Ivy’s unrealistically skinny body as aspirational. Dad bods all around, please.